Mike Hoolihan (Patricia Clarkson) is an unconventional New Orleans cop investigating the murder of renowned astrophysicist Jennifer Rockwell (Mamie Gummer), a black hole expert found shot to death in her observatory. As Mike tumbles down the rabbit hole of the disturbing case, she finds herself grappling with increasingly existential questions of quantum mechanics, parallel universes, and exploding stars - cosmic secrets that may hold the key to unraveling the crime, while throwing into doubt her very understanding of reality. A movie like 'Out Of Blue' is a difficult one to quantify, as it's set out to be purposefully weird and perplexing. In a lot of ways, it's not a million miles away from something like 'Twin Peaks', but has more noir tropes thrown in for good measure to make it even more murky and weird. Whether that adds up to an interesting experience to watch, however, is debatable. That said, you're never not intrigued by what you're seeing. 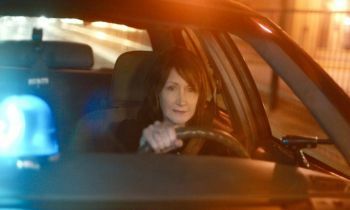 The movie opens with a grisly murder, and Patricia Clarkson's gumshoe detective - complete with leather jacket, bad attitude and putting the button on every scene - is sent to investigate, despite her own misgivings about the job, her place on the force, and all you'd expect from a typical noir detective. As she begins to delve deeper into the investigation, colourful characters rise to the surface - such as the victim's parents, played by James Caan and Jacki Weaver - and her academic colleagues, played by the always interesting Toby Jones, and recent breakout Jonathan Majors. There's a lot to like in 'Out Of Blue'; how it handles the noir tropes and plays with them, Patricia Clarkson's assured and effortlessly cool screen presence, how it plays with the conventions of gender, Carol Morley's visual style, Clint Mansell's soundtrack - but it's also desperately weird, flies off into flights of fancy that are impossible to follow, and when it does snap back to something resembling reality, it feels weirder and unsatisfying than the craziness it followed. Of course, the movie is as much a commentary on the genre of noir as it is telling a story, but while it doesn't always land, it's never boring or complacent in its approach.